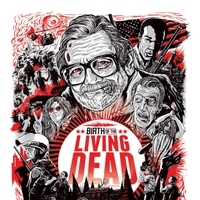 Birth Of The Living Dead Original Soundtrack now available at CD Baby! Original tunes by Gary Pozner and Brian Goss written for Rob Kuhn’s BIRTH OF THE LIVING DEAD are now available for download at CD Baby. Start Rockin’ out today! Check it! Gary Pozner’s musical career has been a long and interesting one. From his early work with fellow Brooklynites FULL FORCE, producing the seminal rap record Roxanne Roxanne by UTFO to opening for the Grateful Dead and sharing a bill with Keith Richards and U2 as a member of Tom Tom Club. All of it culminating with the formation and signing of his African-Celtic-Gospel Rock Band, EO, with Arista Records. This band included such diverse talent as Eileen Ivers on Fiddle (Riverdance), Trevor Hutchinson on bass (The Waterboys), Tom Goss on drums (Richard Barone, Jack Bruce Band) and Dan Weinkauf on bass (They Might Be Giants), Kimati Dinizulu on percussion, Seamus Egan on Uileen Pipes (Solas) and Erin O’Hara on vocals (Mambo X). Most recently he has concentrated on films and has scored over 40 including his newest, Birth of the Living Dead. On this soundtrack Gary get’s to collaborate with long time collaborators vocalist Marlon Saunders (Bobby McFerrin Nine Inch Nails, Billy Joel, Jane Siberry, Shania Twain, Vanessa Williams, Sting, Michael Jackson, Lauryn Hill) and score co-writer Brian Goss (Simon Felice, The Duke and the King).